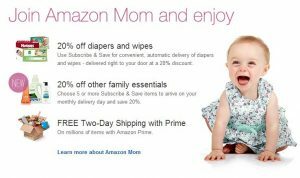 *LAST DAY* Amazon Diaper Deal: $25 off Diapers stacks with 20% off = CHEAP Diapers! Here’s a HOT deal you will want to grab for diapers! Amazon Mom is offering a great deal right now for new members AND you can join for a free 3 month trial. You will be charged for the membership after the 3 months are up, but if you cancel before the trial is up, there’s no charge, so mark your calendar or set an alarm on your phone. Then, make sure you have claimed the $5 off $25 Amazon purchase coupon that is still available HERE. Next, start shopping the eligible diapers HERE. Looks like if it’s not on that page, it’s not eligible, but you should be able to find a great deal. AND make sure your selection is “SOLD BY AMAZON” or they are not eligible for this deal. I suggest selecting 3 months and cancelling the S&S at the same time you cancel the Amazon Mom trial if you aren’t going to keep it. Then, head to check out and use code BABYTIME for your $25 off through 8/29/13. If you find some under $40 you will pay even less AND/OR some even have $1.50 or $2.00 off coupons that make the deals better too! Please comment with the deals you find! does this only work if you never had amazon mom before? All you need to do, is once they send you the email that your order has shipped, you can go in and cancel the subscribe & save completely. It is really easy and you don’t have to get anymore. They will also email you a few times before they ship again so you have time to cancel. Thank you so much for this post! I got a box of 192 diapers for ten bucks! 😀 Can I sign up my husband and do the deal twice? I’m gonna try! Can you use the babytime only once??? Yeah, it’s a one time use code, but you can sign up for multiple amazon accounts and multiple amazon mom accounts. I signed up under me, my husband, and even made an amazon account for the dog! Haha. I’m just going to cancel it all after the diapers get here.